By now, you’ve probably heard that the brand-new San Francisco Museum of Modern Art opened its doors with appropriate flair and pomp. The museum, now more than twice the size of its previous structure, boasts about 33,000 pieces altogether, reminding us all why San Francisco is one of the best cities for art. The museum opened with the beautiful Modern Ball, attracting celebrities and collectors from around the world, ensuring that the new museum was opened with style. 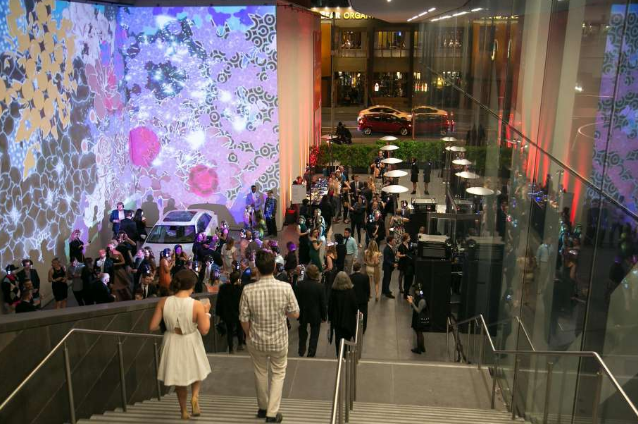 The new $305 million museum, which contains donated and gifted art from collectors like John Pritzker, Thom Weisel, and Doris and Donald Fisher, held its rollicking opening party on May 12th. More than 2,000 guests came dressed to the nines for auctions, cocktails, and socializing. An unnamed collector bid $2.5 million via telephone for a Mark Bradford’s painting Untitled Pink. Of those who attended, 600 guests paid between $3,000 and $10,000 to sit at the Gala Dinner, one of the night’s three ticketed events. Party attendees included Yahoo CEO Marissa Mayer, Olympic gold medalist Jonny Moseley, and fashion designer Rubin Singer, who arrived with a number of models wearing his designs. Guests got to join museum director Neal Benezra and museum chair Charles Schwab for cocktails inside the fancy new museum, and guests took selfies with Instagram cofounders Mike Krieger and Kaitlyn Trigger and Golden State Warriors basketball player Festus Ezeli. An after-party started at 9, and people started dancing. Local drag queens Bubble and Squeak arrived brilliantly dressed, while screenwriter Alex Cooley took the sights and festivities in. What’s more, guests were given bracelets that both allowed them to come in and out of the party as well as lighting up to flash colors to the beat of the music playing. But like all good things, the party came to an end—at a fairly conservative 12:30 AM. Tired, enchanted guests made their way home, having given a splendid welcome to the SFMOMA and its future.